Hi! My name is Roberto Cabero. I have been involved in protection sports for the last 4 years. I started with IPO (Schutzhund) and now I’m involved in Mondioring and French Ring sports. I Certified as Mondioring Level 1 decoy in March 2017 at Mondioring Nationals, it was an awesome experience and I look forward to working Mondioring trials in the near future. In April 2017 I also Certified as IPO Trial helper and now I’m working on my French Ring trial decoy certification. 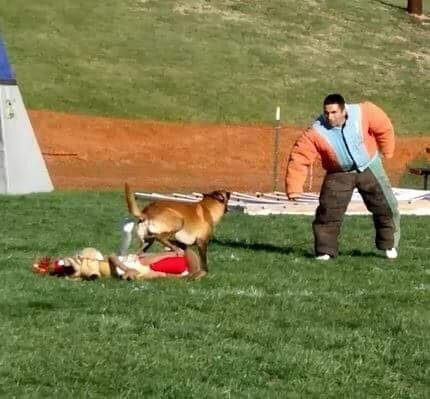 I have a passion about working dogs in protection sports. My goal is to achieve a Mondioring and French Ring Level 3 Decoy Certification and continue to improve my skills not only as a trial decoy but also as a training decoy. I’m being mentored by Fernando Dosta (Level 3 Trial decoy). Fernando is one of the best Mondioring and French Ring decoys in the world so I feel very fortunate to learn from him. I’m trying to learn as much as I can and continue to improve my decoy skills so I can be an asset to our USMRA Organization. Previous Sports Accomplishments before working dogs: Former National and State Tennis champion. Former NCAA Div. 1 Tennis Player.